Most question types also let you insert one image or video and one audio track in Form View (though you can add more than one of each in Slide View). Just click Media or Sound on the ribbon. To open a question slide in Form View, do any of the following, depending on your current view. 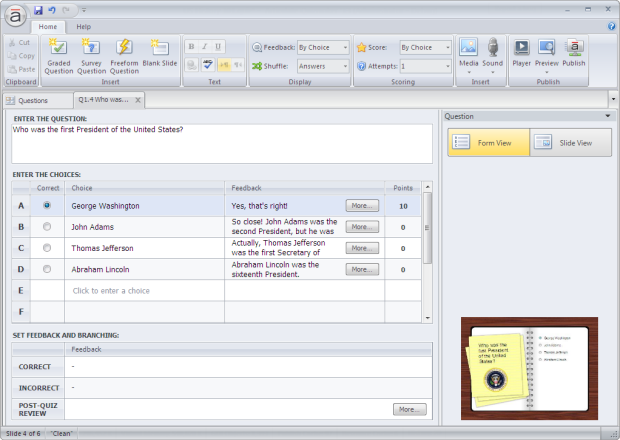 Create a new graded question or survey question. Select an existing question, go to the Home tab, and click Edit Question. 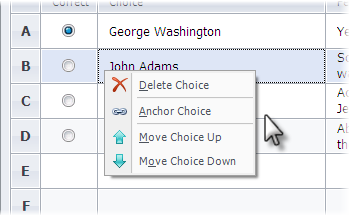 Right-click an existing question, and choose Edit Question. Click the Form View button in the Question panel on the right side of the slide workspace. Blank slides, slide masters, feedback masters, and result slides don't have a Form View. For more control over the appearance of question slides and feedback layers, see Using Slide View.